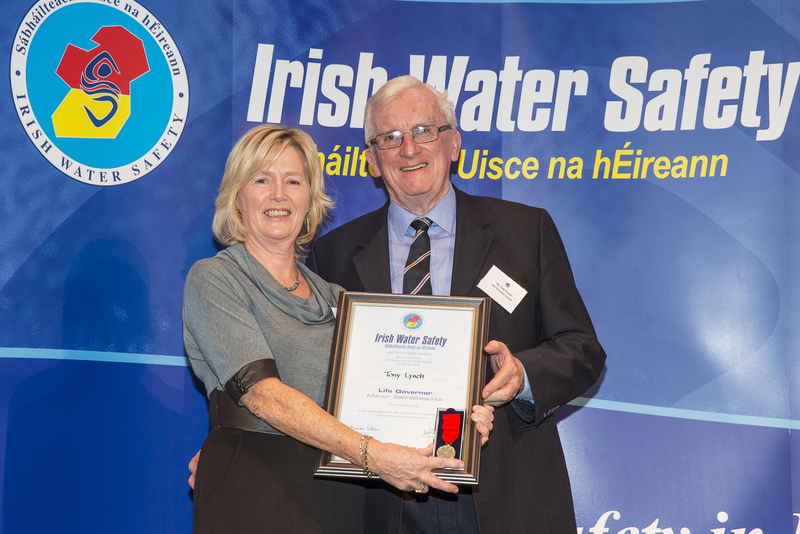 Tony Lynch was recently honoured by Irish Water Safety at their National Award ceremony in Dublin Castle, November 2014. Tony began his involvement with swimming and life-saving as a member of Ennis Swimming and Life Saving club in the early 1950s, when all training took place at open water venues around the town of Ennis, but primarily at the swimming area known as the Turret. Tony and his brothers are referred to in the publication “ Swimming for a Century” as being among the leading ligths for swimming in the Ennis area during the 1950s. Tony started to teach swimming and life-saving as a Red Cross Instructor during the mid 1950s. He was on the Ennis Lifesaving team which won the President’s Trophy in 1957, the first Co Clare team to do so. He was also on the panel that won this trophy again in 1958 but due to the rules of the time (“Must change at least three members of the previous year’s team” – rf My Affair with Malbay), he could not be first team member. He remained an integral part of Life Saving teams thereafter and became one of the leading Co Clare Life Saving coaches/ Instructors during the 1960s and early 1970s. He continued to train teams until the mid 1970s for County, Regional and National competitions. He also ensured teams were prepared and attended the many regattas in the county to put on displays of life saving techniques and discipline. Tony was also a Red Cross Examiner a role he fulfilled since the early 1960s. When the first indoor pool was built and opened in Ennis in 1969 (approx), Tony Lynch, was once more to the fore in ensuring that Life Saving continued to be taught at the this new venue. Tony and others also ensured some lifesaving and swimming was taught at some of the earlier open water venues. Tony Lynch was to the fore during the change from Red Cross to the new Irish Water Safety Association in 1972. He helped manage the change in Co Clare and continued in his roles as Instructor and Examiner within the County thereafter. Tony always had a great interest in Lifeguard standards. He was one of a small National group selected to visit Huntington Beach in California to see how Lifeguards were trained (rf Paddy Phipps). This knowledge was used to begin the process of increasing lifeguard standards throughout Ireland. One of Tony’s big jobs in Co Clare during the 1970s and 1980s was the examination of lifeguards for Clare County Council, a job he did with fairness and thoroughness. When Tony was examining he was very keen that conditions were real, which lead on many occasions to candidates arriving to the Ennis Swimming Pool for the test, only to be told they had to relocate to Tony’s chosen outdoor test venue – Ballyalla Lake were amongst his favourite venues for a time. He also used the outdoor pool in Lahinch, which would have been full of cold water during the pre season. As a Local Authority employee he was able to apply for the position of Water Safety Development Officer, a post he attained with Limerick City and one he held until he retired circa 2004. He attended the annual water safety officers conference regularly. Tony was one of the prime supporters of the Beach Lifeguard award becoming a pre requisite to apply for a job as lifeguard at one of our coastal locations (rf B Mc Grath). After retirement Tony continued to be present at Lifesaving events offering advice and support continuously. He continues to be a person who Life Saving people in Co Clare turn to for advice or to check a historical query / event. He also visits the Ennis Swimming Pool to watch and offer encouragement to the current batch of local swimming stars. In 2014, Tony, was again, directly involved with the recruitment of lifeguards on behalf of Clare County Council. Tony is one of the gentlemen of life saving and has been responsible for the on-going involvement of many through his positive supportive nature.